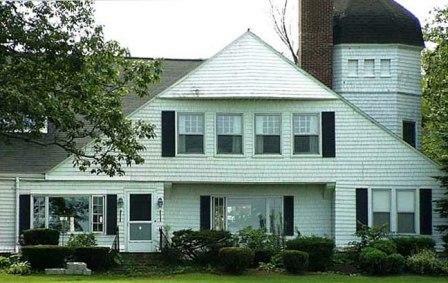 The Shingle Style is characterized by simplicity, attention to comfort, and of course - shingles. The term was popularized in the 1950s and is sometimes referred to as the "seaside style" as the style was favored by the seaside estates and resorts of the New England coast. 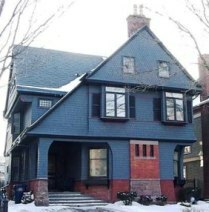 The Shingle Style had its origin in the Boston area in the early 1880s. Henry Hobson Richardson (1836-86) is credited with developing the style and over the next two decades it spread across the country. The style had a significant influence on Frank Lloyd Wright. Borrowing wide porches and asymmetrical forms from the Queen Anne style, the Shingle style houses were designed from the inside out giving the interior living space priority. Rooms were larger and fewer. Windows were placed where there was a need for interior light. 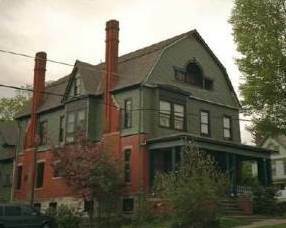 Where appropriate, outside space was brought into the interior by way of porches and covered verandas or loggias. 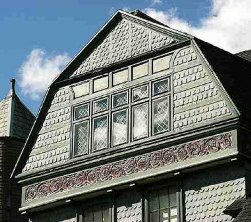 Small, manufactured shingles were available in many colors and made it easy to cover the variety of shapes and irregular roof lines that contribute to this picturesque style. 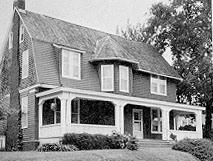 The Shingle style of building is uniquely American. They are usually complex shapes united by a skin of shingles. •	Sheltered by a broad and overhanging roof. The sweep of the roof may continue to the first floor level providing cover for porches. May be steeply pitched and multi-planed. •	Interior: large rooms and porches loosely arranged around an open "great hall," dominated by a grand staircase. 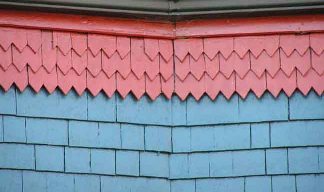 In most cases wood shingles were used extensively although stone and brick was often used on the lower floor. A semicircular arch was commonly used somewhere on the exterior such as verandas and loggias. 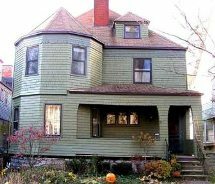 Consistent with Shingle architecture detailed trim was restrained. 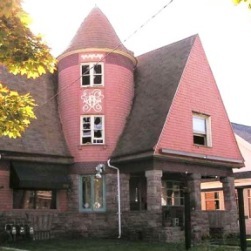 Compared to the early Victorian period this architecture was considered modern. .